GTCAPTMsuper capacitor modules are continuously applied to electric vehicle as a substitute of batteries. 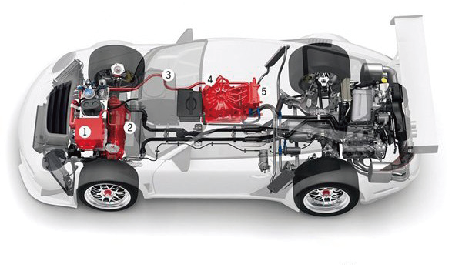 In picture 1 that shows the hybrid electric vehicle structure, GTCAPTM super capacitors are used to capture braking energy, assit vehicle start and offer large power qucikly to climing. In regenerative systems, energy is captured and re-used at a later time. 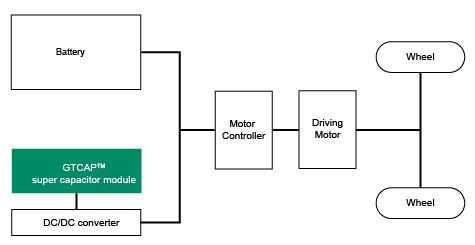 The energy capture comes from the vehicle braking system and is subsequently used in acceleration or for the support of accessory loads in vehicle architectures. These events are typically short in duration (lasting just seconds to a few minutes) but very high in power. Super capacitor modules provide an ideal solution as the energy storage device for these applications. With their high power capability, super capacitor modules are more efficient at recapturing and storing energy, especially when it comes in bursts. Previous：Super Capacitor Modules For Smart Grid and Micro Grid Next：What is Ultracapacitor (Supercapacitor)?